My brother-in-law mentioned the same thing — I should look into that. Serial killer or not, that’s a valuable service! GF liked to stick her iPhone in her back pocket. Well, on Boxing Day, she took a trip to the potty and… Well… SPLOOSH! She was too excited about making it work, so she broke the rules I kept repeating to her about leaving it off, and letting it sit in rice. Phone go bye-bye. She’s been Motorola-ing it out ever since. The most basic phone ever. It just makes and received called and text messages. And maybe it has an alarm. Ha! Ahhh! The same thing happened to me while taking photos on the not-so-sly at a bed bath and beyond. I had some dude fix it for $50 bucks, but after a little google work I found a youtube video documenting a step by step of how to change the screen yourself and you can hit up amazon with your phone model and grab a new screen for cheap. good luck. The panic attacks usual start about 30 seconds after I realize that my phone isn’t on my person. It’s a sad, sad dependency but I’m willing to accept that. It really is such a sad dependency. I sometimes think about going to back to a normal phone, but I don’t think I have it in me. P.S. Did you know in the iPhone manual it say to always have your phone at least 3/4″ away from your body when you’re not using it? Scary shiz! you are not alone…My daughter did the same thing. She quickly called me for comfort and support at that moment of duress and grief. I tried my best to console her speaking calmly into my plastic landline which I could care less if I dropped, lost or broke. I assurred her that in time she would calm down and return to a natural state of mind, although, I had my doubts. I kept to myself the fact that she had a special customized case not available to regular iphone owners, one that protected the machine from all possible evils. 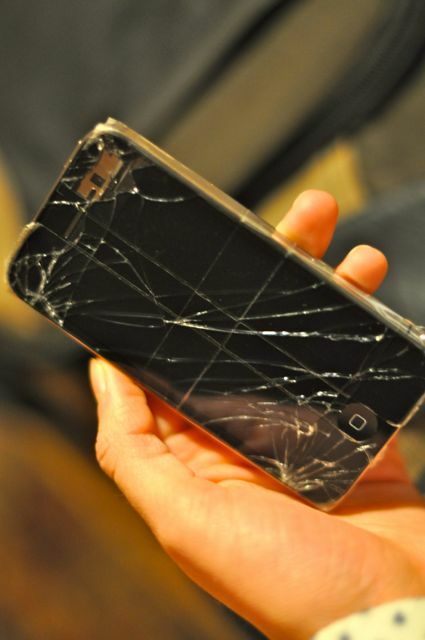 A case given to her by her personal verizon account manager after she ran over her last phone with her nissan exterra. I would not pass judgement at this difficult time. Instead , I continued the conversation consoling her with as much apathy that I could muster…which wasn’t much, but I faked it pretty good. When it was time to say good bye, I felt confident that she was ok to move on. I told her that I loved her and she is, like you, not alone. I reminded her once again…there will be many more phones in her life. 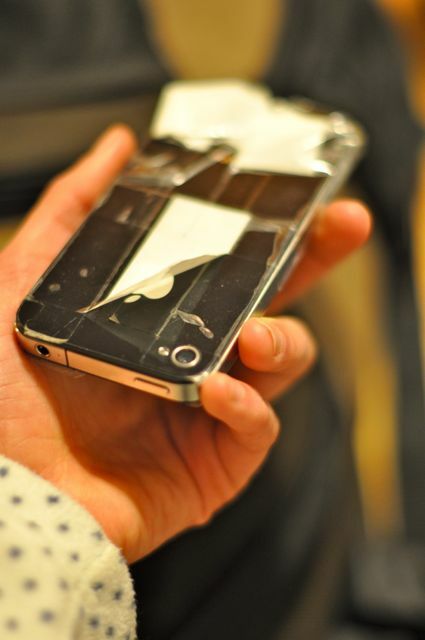 A broken iPhone is the worst heartache there is.